If I had to pick a few choice recipes for you to try on this blog, caramelized tomatoes would be one of them. Caramelized tomatoes are sublime -- once you've tasted their concentrated, toasty flavor, you might never go back to regular tomatoes. In addition to eating them like candy because they are so addictive on their own, they are wonderful served with crackers and cheese, used in pasta dishes and soup -- I threw them in some beef barley soup this week -- and in sandwiches, as I did here with caramelized onions and gouda cheese on baguette. Honestly, making these caramelized tomatoes is like winning the lottery, as they open doors to a wealth of dishes. The sky's the limit! I first made these tomatoes at my friend Christine's house. We house sat there last summer when we were between houses. I was pretty freaked out to have sold our house and not have anywhere to go, but staying at Christine's house turned out to be the best thing that could ever happen. In addition to being a lovely, comfortable, and comforting home because of the gracious spirit of the people who live there, Christine's house has a prolific vegetable garden, Gifted with dozens of cherry tomatoes every week, I had a chance to try this recipe for caramelized tomatoes at the blog Tigers & Strawberries. 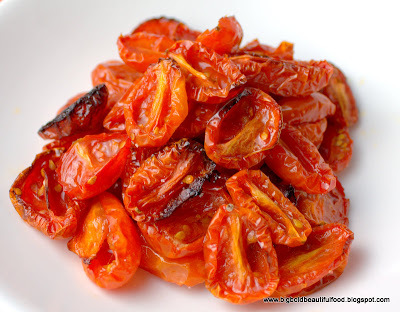 Within 40 minutes, I had the most delicious tomatoes, soft yet crispy, roasted yet fresh with garden flavor. Sunlight in a bottle, or rather tantalizing, little red bowls. I hope you try them! I used cherry tomatoes here, but you can do plum, grape, or regular tomatoes. Core if necessary, taking out the leafy stem. Cut in half and squeeze and/or scrape the seeds and liquid out with your fingers. Put the cut tomatoes in a bowl. When done cutting, toss the tomatoes with olive oil, making sure all tomatoes are lightly covered with oil. They shouldn't be drowning in oil, but there shouldn't be so little oil that they will dry out in the oven. Lay all of your tomato halves or slices cut side up on a baking sheet (you can cover the bottom of the sheet with non-stick foil or silpats for easy clean up). Leave them in the oven for thirty minutes and then check them. If they are a bit shrunken and drying a bit with some toasty dark bits on the edges, they are ready for you to sprinkle on the sugar. If they still seem a bit too juicy and there is no darkening, give them another ten minutes in the oven. If they are ready, take them out of the oven. Sprinkle a little bit of sugar evenly over the tomatoes. At this time, if you want to add herbs, either fresh or dried, this is the time. Put the tomatoes back into the oven and let them cook for another five to ten minutes or so. Remove from the oven, and allow to cool until you can handle them–they should still be warm, but not blisteringly hot–and remove them from the baking sheets and set them on a tray or in a bowl, depending on how you want to use them. 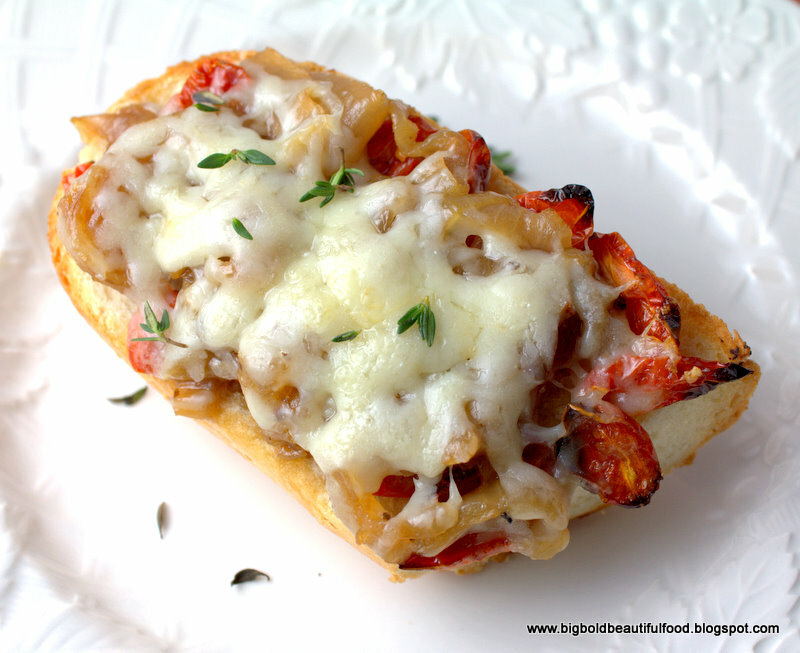 Any syrupy juice that you have on the baking sheets, scrape out and drizzle over the tomatoes. You can store them in the fridge for up to a week, and you can freeze them for later use. 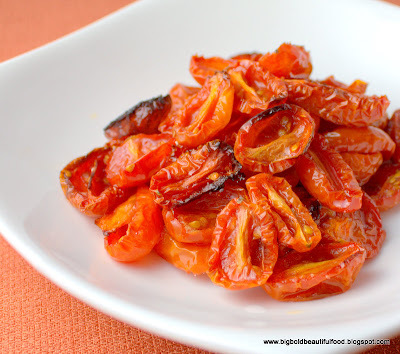 There is nothing better than roasted tomatoes - yum. How would you go about storing them for later use? Short time or long time?? Hi Dianna, you can store them in the fridge for up to a week or freeze them. I find they don't last very long as I find they're either eaten up or used in other recipes through the week. I think I'm in heaven! I'm ready for tomato season to start now! Unfortunately there is snow on the ground, so I think that might take a while. I'll let you know how fantastic they are in the summer! wow, I must try this! I normally just roast the tomatoes, I like the idea of adding sugar! I just planted some cherry tomatoes and I hope to get a ton so I can try this! I love everything tomato..my grandparents neighbor used to make us something similar to this and you are right, the intense flavor is to die for. Beautiful! This is definitely going into my recipe index! Summer in Florida means tomatoes will be plentiful and cheap. The flavor is perfectly concentrated and so wonderful. Thank you so much for posting!